America can't get enough of Gordon Ramsay. He'll soon be bringing us yet another show to join is empire. But this time, kids will take center stage. Would you trust your kids with knives...and this guy? That's right - unlike Gordon Ramsay's other Fox shows, including Masterchef, Hell’s Kitchen, Hotel Hell and Kitchen Nightmares, this show will feature young, impressionable kids between the ages of eight and 13. 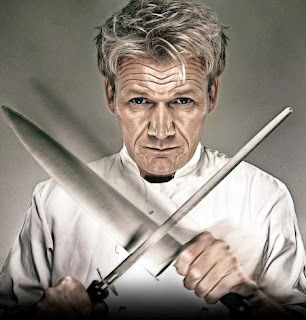 Ramsay was inspired to create this show because he saw how much his own kids like to cook, and he cites their skill and passion as extraordinary. My question is - will the kids - and their parents - be able to handle the heat in the kitchen? Gordon Ramsay's hardly known for being a kind, compassionate human being. Will he tone it down for the kids, or will they face the same abuse as their adult counterparts? And if he does tone down his abrasive personality, will the show still have the Gordon Ramsay appeal? The show will premiere September 27th, 2013, so we'll get our chance to see Ramsay in action at that time. Until then, we'll have to wait and see if Ramsay can control his temper or plans to make kids cry on TV.